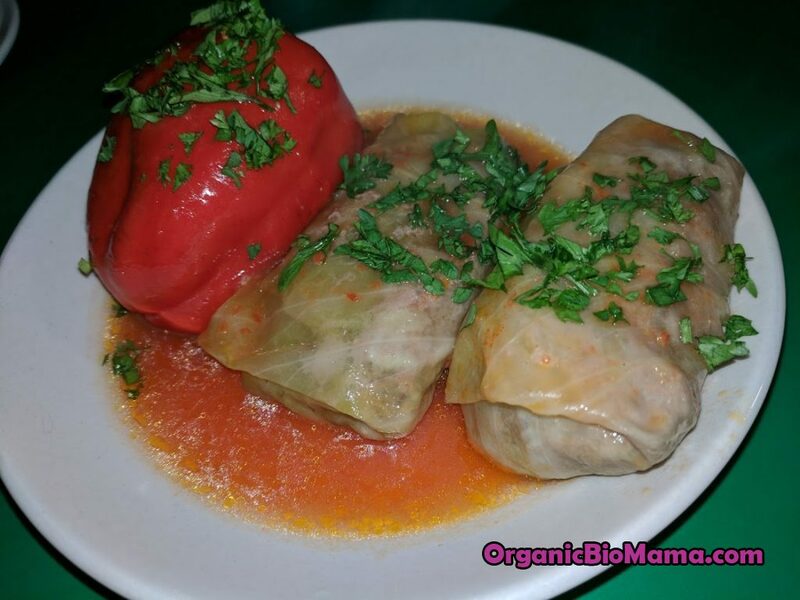 This recipe of cabbage rolls and stuffed peppers does not include or need frying. This dish is extra delicious and approved by children and adults in our family. It is especially yummy when served with sour milk, sour cream, plain cream, or kefir. Separate the cabbage leaves carefully and avoid breaking them while doing so. You can remove the cabbage base to make it easier to separate them or you can cut a leaf near the base to separate. Boil some filtered water in a large saucepan. Drop the cabbage leaves to the boiling water and take them out when they soften (2-3 minutes). This is needed to keep the leaves from breaking when stuffed and rolled, so we only need to soften the leaves and not to cook them through. Remove the top of the thick part in the middle of each leaf to make it easier to roll. Wash sweet peppers and remove the base and the seeds. Chop the onion finely or use a food processor. Grate the carrots using small grater blades if you are using carrots. Mix ground meat, chopped onion, grated carrots, and washed/rinsed rice together. Add salt, ground black pepper, cumin, chopped or dried basil, olive oil. Mix. The stuffing is ready. Prepare a pot by putting a little oil in it. You can put some chopped potatoes and carrots on the bottom if you would like. Fill the sweet peppers with stuffing. Place them all in a pot (over potatoes and carrots, if using). 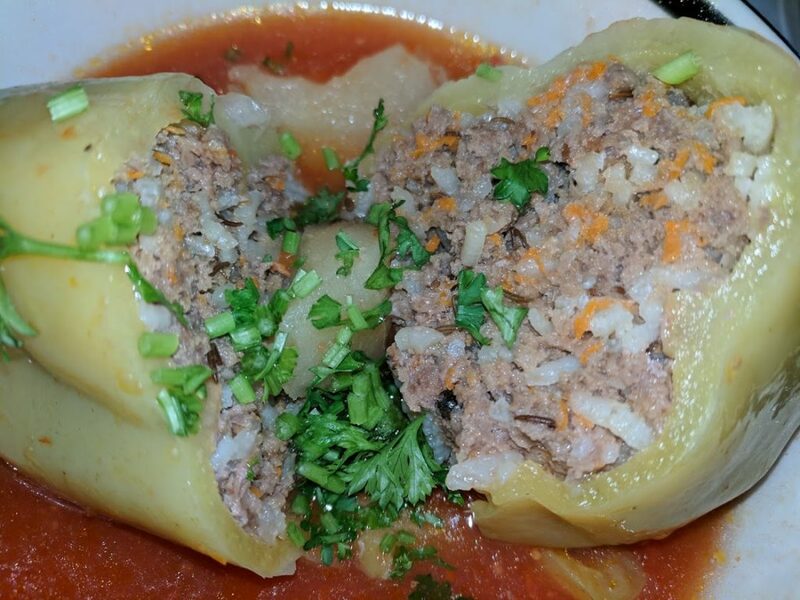 Put some stuffing on a cabbage leaf, fold the upper part first, then fold the sides, then fold the remaining part and roll it. 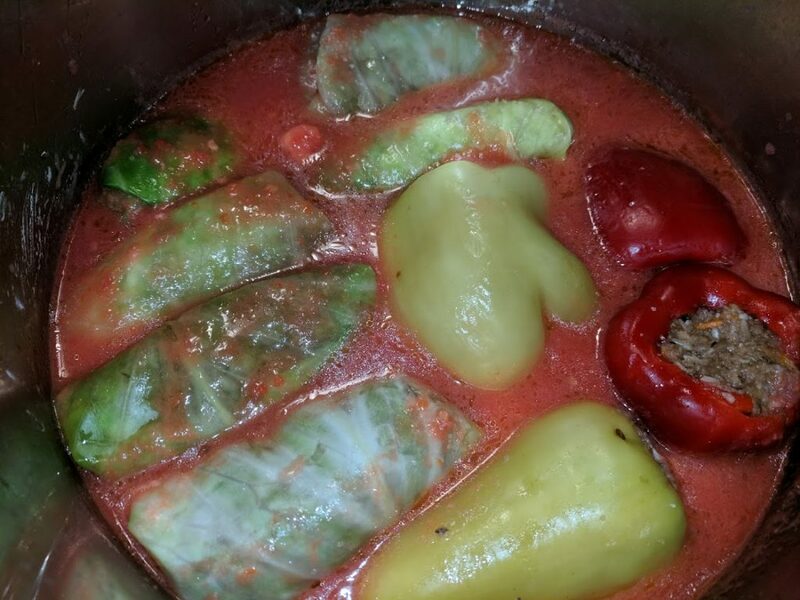 Place the rolled cabbage leaves in the pot over sweet peppers or near them. Mix 0.5 cup of water with 1 Tbsp of potato starch (or organic all-purpose flour) and tomato sauce. 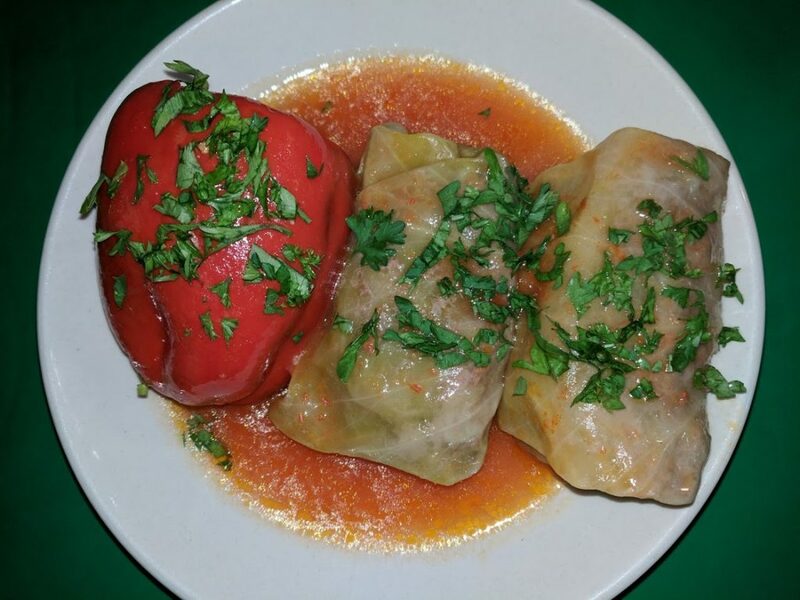 When there are no clumps pour the mixture over stuffed peppers and rolled cabbage leaves. Add more water to make it cover the cabbage and peppers. Add a little salt to the water in the pot. Bring to a boil. Cover the lid and stew for 35-40 minutes. Serve with chopped greens (cilantro, dills) and/or a sour milk.